Danger Goat revels in the death animation. It wants to make you laugh and cry as your poor protagonist is electrocuted, crushed, blown up, and flung off of the side of mountains. As you can see in the game’s intro video below, developer nDreams has taken a lot of pride in coming up with creative ways to kill the cartoon critter, no doubt influenced by slapstick hit, Goat Simulator. But here’s the problem: up until the final three of the 28 total levels, I only saw one of those animations for myself. For a game all about silly deaths, Danger Goat plays it a little too safe. nDreams’ Daydream debut is a third-person puzzle game in which you guide a goat up a mountain, avoiding increasingly tricky traps across each of its 28 levels. You use the Daydream controller as a pointer on diorama-sized maps, navigating around dangerous paths and tilting the world to topple boulders that either crush traps or open up new avenues. At surface level, it makes for harmless puzzling fun. Danger Goat is an early example of how intuitive the Daydream controller really is, allowing for an accessible point and click experience that anyone could get to grips with, even if it’s necessary to recenter your view after every level. The worlds are colorful and inviting, too, though this is one mobile VR experience in which I really missed positional tracking, as I couldn’t lean down further into these worlds and at times the camera didn’t get close enough to the action. 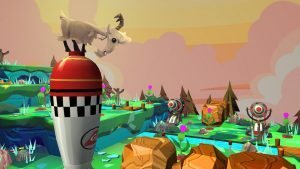 In fact, generally speaking, there really isn’t any reason for Danger Goat to be in VR. It could have just as easily been a standard mobile game, although it obviously would have a harder time competing in that space rather than the relatively light Daydream store. It’s nice to be able to look down and see the world beneath you, but without the ability to truly lean in and get up close, you might as well be playing on any other device. For the most part, Danger Goat‘s traps will involve you accidentally walking onto a marked tile and subsequently watching your goat get obliterated. Later levels introduce a few other concepts like switches that activate gates and weapons, or rivers that carry you downstream, but the basic threats don’t really change until the final seven challenges. You’ll quickly learn that many of the traps laid out in a level are nothing more than red herrings. They’re there to trick you into tossing a boulder on them to crush them, when really you needed the rock to cross a canyon. Slip up and you’ll have to start the level from scratch if you want a three star rating. But with Danger Goat‘s love of deception established so early on, you’ll find you never really fall for the perils it lays down in its first 25 levels or so. Every time I saw a trap in front of me I’d scan the environment and quickly find a way round it. That’s what you’re meant to do, of course, but I was going through levels with such ease I started to wonder what the point in it was. What makes this even more frustrating is that the final three levels bring together the game’s mechanics for some truly challenging trials. They genuinely stumped me for some time and had me going round in circles and I really enjoyed systematically solving them. If the game had reached this point, say, halfway in and not spent so much time coddling the player this would be a very different review. This is a likable, spritely launch title for Daydream View that suggests nDreams has far more to offer than its murky thriller, The Assembly. With a heavier emphasis of challenge, Danger Goat could have been one of the platform’s best games.